The development of North America's shale resources has provided B&G greater opportunity to serve the Oil and Gas industry. Identifying an opportunity to increase efficiencies for customers, the Company dedicated itself to becoming a multi-service, multi-basin oilfield service provider. With experienced leadership and a continued commitment to superior work quality, customer service, and safety, our organization has grown to become the premier oilfield service provider for exploration, production, and midstream companies in the Northern Plains regions. 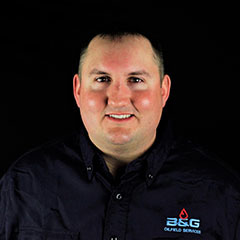 John has been with B&G Oilfield Services since April of 2014. Prior to B&G, he spent over 20 years as an officer and helicopter pilot in the U.S. Navy, where he gained a wealth of operational management experience. He has a proven track record of increasing the operational efficiency and profitability of organizations. He also has significant expertise with strategic planning, personnel management, and business development. He graduated from the United States Naval Academy, has a Master’s Degree from the U.S. Naval War College, and an MBA from the Wharton School, at the University of Pennsylvania. John is married and has two children. In his free time, he likes to run, work out, travel, and spend time with family. Mr. Alex Alexandrou joined B&G Oilfield Services in September of 2016 as Vice President, Strategy & Business Development. Prior to joining B&G Oilfield Services, Mr. Alexandrou was the President & CEO of Green Oilfield Services, Inc., a Texas-based private energy technology group. Mr. Alexandrou is a global senior strategic operations executive providing impressive achievements in multiple disciplines with a dynamic 22+ year career in diverse industries including oil & gas, manufacturing, consumer product goods, academia and consulting. Mr. Alexandrou directed national business programs, business development, and alternative energy strategy for Murphy Oil USA, Inc., a Fortune 100 company, and conducted business in 25 countries to turnaround languishing operations, lead strategic business mergers, expand business opportunities, and start global offices. Mr. Alexandrou holds an M.B.A. and B.S. from Louisiana Tech University. Rick Thompson has worked in the Bakken since 2005 and has been with B&G since May of 2016. His role as Director of HSE and Training is one that he takes personally. He views the people at B&G as a family and the safety and well-being of those individuals is more than just a job to him. Rick takes a proactive approach to safety and believes that our people are our most valuable asset. In his free-time he enjoys spending time with his daughters, camping and hunting. 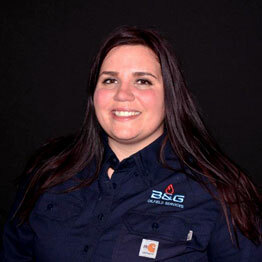 Shannon Giblock is a native of Wyoming and has been with B&G since 2010. During his tenure at B&G Shannon has been involved in many aspects of the business including DOT Compliance, Safety, Asset Management, Fleet Management, Accounting, Purchasing and general Business Programs. Shannon is a tenured professional with over 17 years in the Oil and Gas Industry. 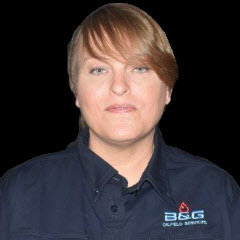 Prior to B&G Shannon has been in Procurement and Supply Store Manager roles and worked in the gas fields of Wyoming primarily involving Gas instrumentation. Shannon attended college in South Dakota where he studied business management. Brian Conlin, a Williston native and 28-year veteran in the construction and energy industry, started with B&G in 1997 as a roustabout and truck driver. Shortly thereafter he moved into the shop as a diesel mechanic. In 2002 Brian became the B&G shop manager. 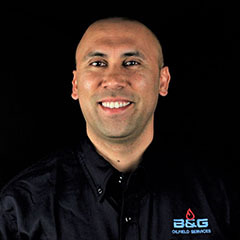 As B&G expanded, his role has grown to include the management of a fleet consisting of 260 vehicles and shop equipment. 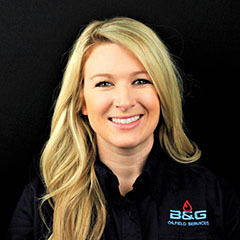 Brittany Kilgore is a California native who joined the B&G team in 2014 as an HR Generalist. Brittany was promoted to her current position as HR Manager in February 2018. Prior to working at B&G Brittany attended University of North Dakota where she earned her degree in communications. In her free time Brittany enjoys spending time with her family. 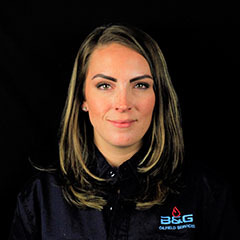 Sarah joined the B&G team in July of 2018. She has a strong Oil and Gas Industry finance background, having worked specifically in Oil and Gas for four years and in the general accounting field for over ten years. She holds a Bachelor of Accounting from the University of Minnesota and is currently studying to pass her CPA Exam in 2018 with plans of obtaining an MBA. Sarah has one son and welcomes both Exchange Students and foster children into her home. During her off time, she enjoys spending time with her family and pets, traveling, the outdoors, and attending her children’s many sporting events. Brad Gorder was born and raised in Williston, North Dakota. Upon completion of high school, Brad attended college in Minnesota where he studied business management and marketing. Brad, whose grandfather founded B&G in 1966, joined the team in 2005 and spent his first four years in the coal bed methane fields of Wyoming. While working in B&G’s Wyoming operations, Brad gained an in-depth knowledge of pipeline gathering networks and utility locating. Brad moved back to Williston in 2009 where he worked in numerous capacities as a supervisor of well-site and gas compression operations. 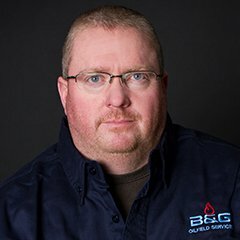 Brad’s experience and dedication to quality workmanship has enabled him to build strong relationships with B&G’s customers. In his free time, Brad likes to spend time with his family and enjoys fishing and snowmobiling. Hercules joined the B&G team in February of 2017 as Integrated Services Manager and was promoted to Manager, Strategy & Business Development in August of 2018. Prior to B&G, Hercules Cummings served the U.S. Navy as a nuclear technician. In addition, he brings a diversified background encompassing project management, business development, and technical experience as a project engineer, titanium plant operator, casing foreman, and small business owner. He holds a BS in Nuclear Technology from Excelsior College, MBA from University of Phoenix, certified in Project Management and Business Analytics through Villanova University, and currently in the Master’s degree program for Accounting through Colorado Technical University. Hercules is married with two boys. During his off time, he enjoys hanging out with his family, traveling, writing, basketball, coaching his son’s martial arts, hiking, and camping. Jeffs Dutson has been with B&G for three years. He started as a pipeline equipment operator and transferred into the pigging and line maintenance division three months later. He is currently in charge of internal pipe maintenance and gathering network maintenance. His experience comes from working with two previous resource gathering organizations and working in the pipeline maintenance divisions with oil and natural gas clean outs, pressure testing, line purging, as well as the three years with B&G in the pigging division. On weekends and time off Jeffs can be found snowboarding in the winter and fishing in the summer. James Smith is a native of North Dakota with extensive oilfield knowledge and experience. At age fourteen, James began to work with his dad in the oilfields surrounding the Portal, ND area. Since, James has served in numerous roles, including laborer, operator, foreman and manager for pipeline and roustabout services. James joined B&G in 2009 and has continued to increase his role within the Company by providing continued leadership and project management. His breadth of experience has allowed B&G to better serve its customers through increased operational efficiency and work quality. James is married and has a son and two daughters. In his off-time, James enjoys spending time with his family, fishing, and camping. 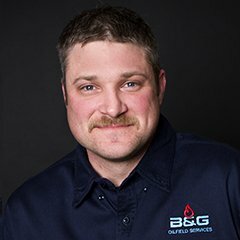 Dustin Wentz started with B&G in 2005 in Sheridan Wyoming as a laborer for the pipeline division. He later transitioned to the roustabout division working on compressor stations and tying in meter runs. Dustin later moved to North Dakota to take a position as Roustabout Supervisor. Dustin is well rounded and has worked in many different rolls at the company including; pipeline, utility locating, compressor maintenance and hydrovac services. Dustin has three children and enjoys spending time with his family in his spare time. Shaylee Stuen has been with B&G since June of 2016 when she first started as a line locator. She was promoted through the ranks quickly to Supervisor in September 2017 and to Manager in June 2018. In her spare time Shaylee enjoys spending time with her family, baking and watching sports. 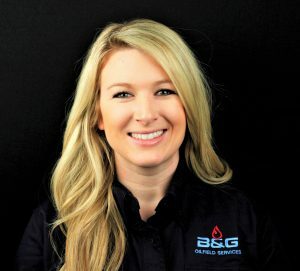 Heather Alexander joined B&G in August, 2015 as a locator and quickly became an expert in Utility Locating leading to a promotion as an area lead in July, 2016. Heather was further promoted as Supervisor of Utility Locating in February, 2019. During her free time, Heather enjoys spending time with her family of 5 children and writing poetry and music. Drew started with B&G working on the pipeline as a labor hand in 2011. Later Drew was made foreman and was then promoted to Assistant Superintendent in 2016. Drew runs the field operations and assists in the job bidding process as well as talent acquisition for the pipeline division. In his free time Drew enjoys ice fishing in the winter and spending time with his family. Kyle Helmstadter began his career with B&G in December of 2014 as a Hydrovac Operator. Kyle was promoted in 2016 to Hydrovac Lead Operator, further promoted to Hydrovac Supervisor in 2017 and in 2018 promoted to the role of Manager, Hydrovac Services. Kyle is responsible for all hydrovac operations including compliance, and permitting and excels at time management and scheduling of his crews. In his free time Kyle likes to take advantage of North Dakota’s outdoors by fishing and hunting.